There. I said it. As if you didn’t know. Maybe I didn’t really know. Maybe my desire to do this stupid post made it pretty darn clear to me. I’ve got “issues”. (Said in my best Christ Farley voice). Did I mention fuzzy photographs??? So there. All of the above have been stopping me for weeks. Not to mention, this is the age of Pinterest where gorgeous, magazine quality inspiration is at everyone’s fingertips. 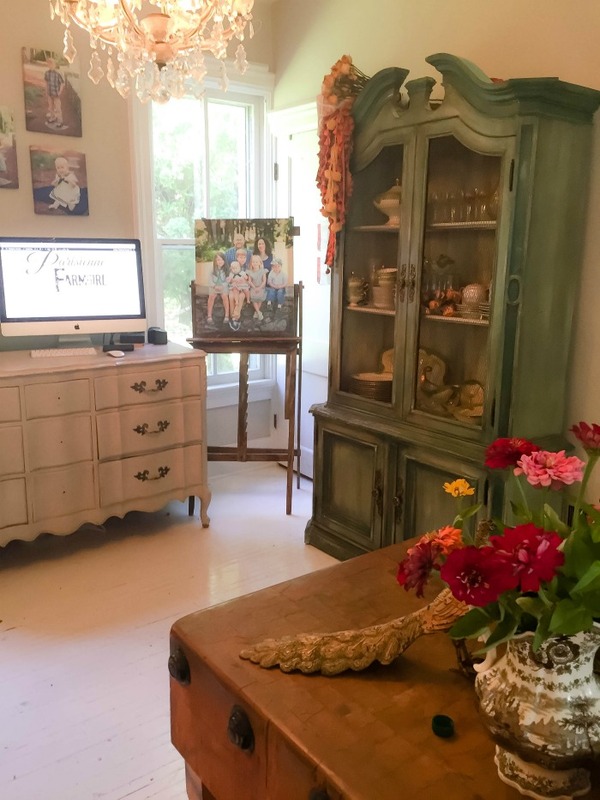 As a blogger who enjoys sharing her life, it’s VERY difficult to not compare, to wonder WHY would anyone want to see MY mangy, garage sale living room??? Hello everyone, my name is Parisienne Farmgirl and I like things perfect. They never are. And thus, I live a tortured existence. Geesh, Ang, you’re thinking. All I wanted was some damn tips on French-inspired decorating. 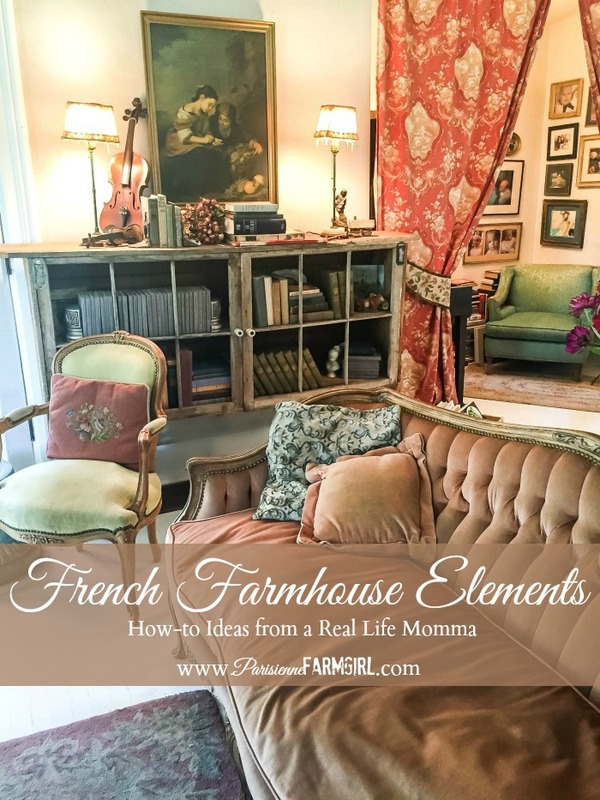 Some French Farmhouse Elements for crying out loud. Fine. You got it, girlfriend. 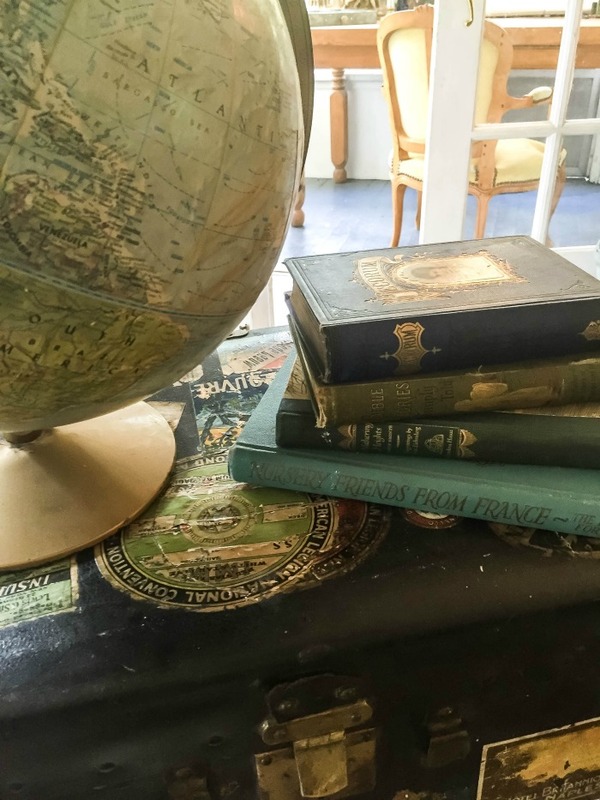 France has colonies around the world and if you look at French décor magazines you will see the influence of those colonies. 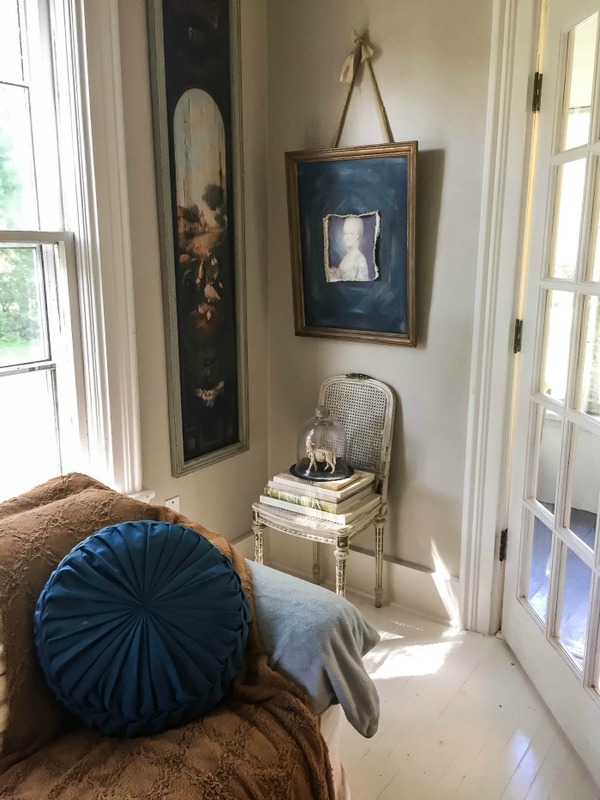 I don’t have anything like that displayed right now (because I rotate stuff) but when decorating with a “French” style it’s totally cool to have a touch, ever so lightly, of Moroccan, African or Polynesian. Just a little. Once, for me, it was a very ornamental pepper grinder that looked like I had found it at a bazaar in Marrakech. 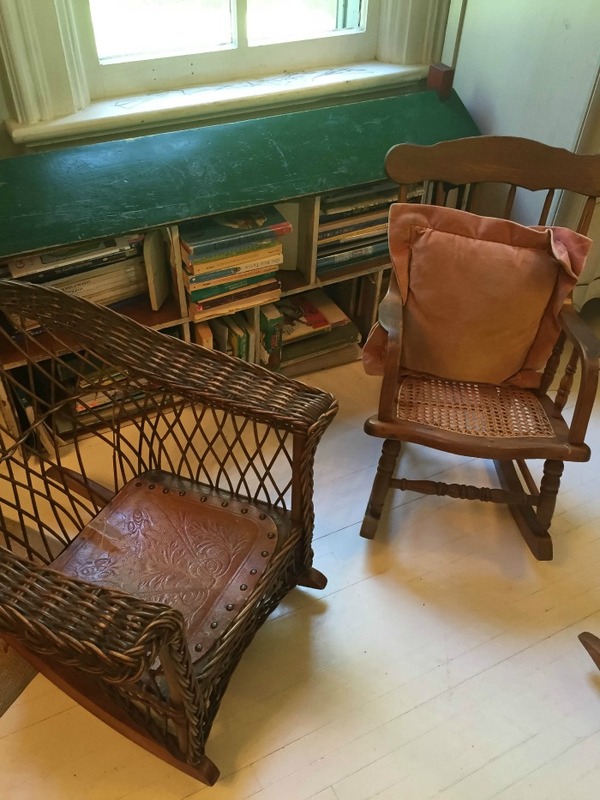 Family heirlooms and books with cool titles. Stumble upon some old oil painting of some old dude? Buy it. Hang it up. Because hey – instant history. Seriously…. 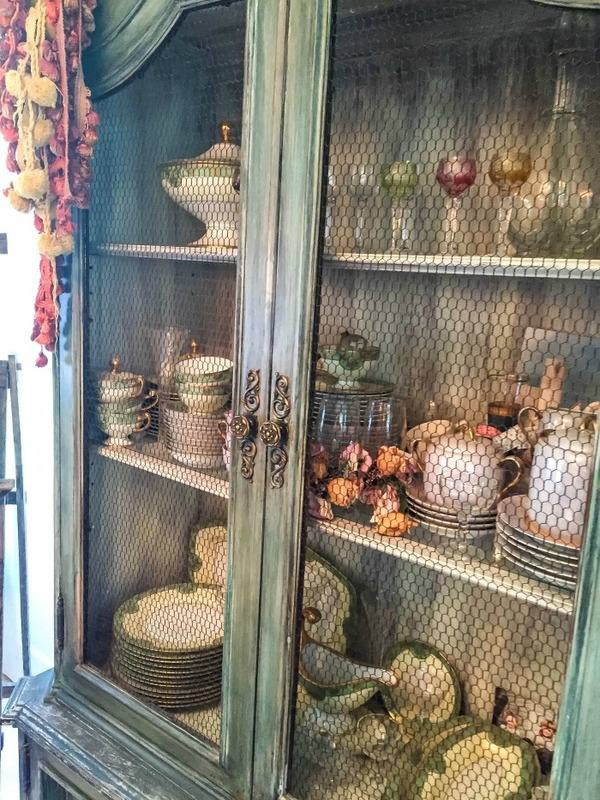 display your family treasures as simple as they may be. In the photographs below you will see a quilt made by my Great Gramma draped over my china cabinet, family photos shoved here and there, Aidan’s Great Great Grandpa’s violin on display and more. And nerd alert…. I’ve got a LOT of old books about. Like some who pick wine bottles for their cool label, I pick my old books for their interesting topics. I like to pick ones that reflect my particular hobbies so I have a lot of old books on etiquette, opera, music, Marie Antoinette, etc. Is toile outdated? Well, I’d steer clear of that typical Waverly print if I were you, but by all means. Go toile. Toile de Jouey. A little. A lot. I love it and don’t think you can go wrong. My toile drapes from the old house are being used here to separate the living room from a little piano/book nook I made. The tie backs are from a Paris flea market. I miss them in my bedroom like the old house (here) but they are ratty and wonderful and I can’t box them away. I love velour, velvet and silk and so I’ve got chairs and sofas covered in all three but when you look at a LOT of French homes, be they in town or a farmhouse, there is a whole lot of IKEA going on there and so to add a casualness to the room and to accommodate my crazy children, I bought a big white IKEA sofa a couple years ago. (I’ve been called nuts for going with white… but you can’t bleach beige now can you?) Providing that our living room is bigger at the next house I will be buying a matching chair and/or another sofa. I love the walls of our piano nook covered in family photos (I need to add more. That’s my winter project) and I love the stacks of books just piled up on the floor. It is what it is. We don’t have room for bookshelves and “making it work” is super French. Seriously. Whether it’s a lack of closet space or dining room tables that double as desks, they know how to make it work. Joel got me a butcherblock for Christmas a few years back. It’s the size of a Volkswagon and this house is the size of a conversion van. What was I going to do? Store that beautiful thing in the barn? Aw heck no. I made it an end table. Boom. So anyways… you get it. 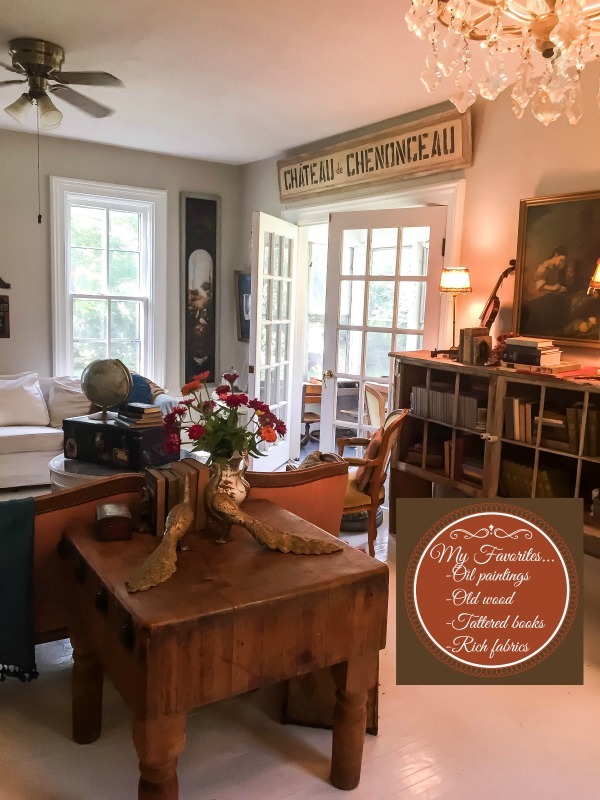 Go rustic, go fancy, go international and mush it all together and you’ve got some serious French Farmhouse Elements. Says I.
Shall we proceed with the tour? This one and many others could be the cover of a magazine. Seriously ! You homeboys just divine whimsy ❤️ ! Oh my. Auto corrected something I wrote to homeboys Hilarious! Anyway. I love love your home ! Thanks for sharing ! 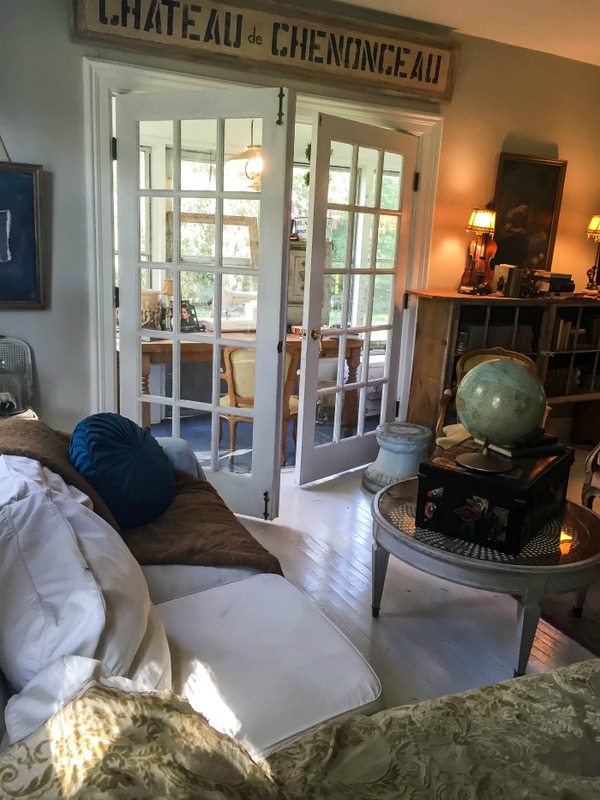 As i have learned, the most important elements in designing your home should be to celebrate your passions, surround yourself with things that you and your family love, and make your home “welcoming” to others. When you design with your heart, no matter what your STYLE is, your home will be amazing. 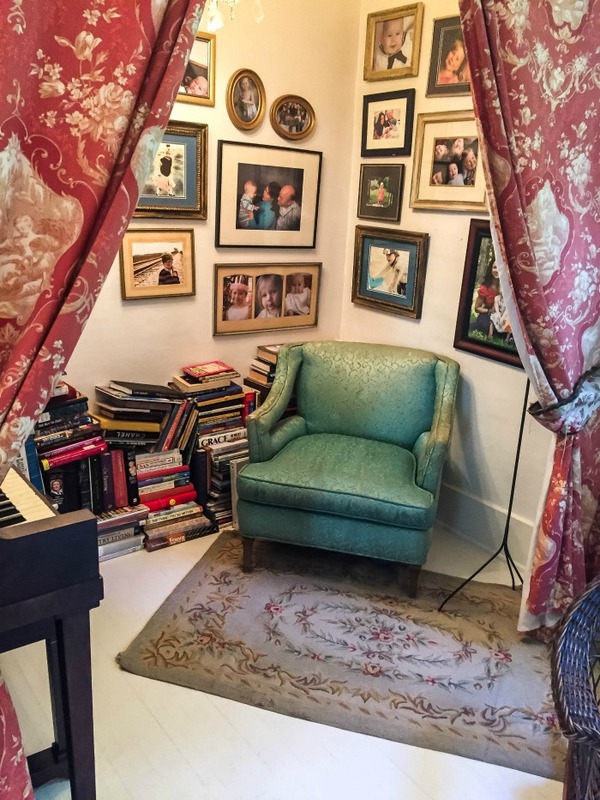 I really like your piano behind the curtain and the groupings of photos . Touches of decorating that make your home a special reflexion of your personality and style. Love peeking into others home environments so I can get a look at how others live. 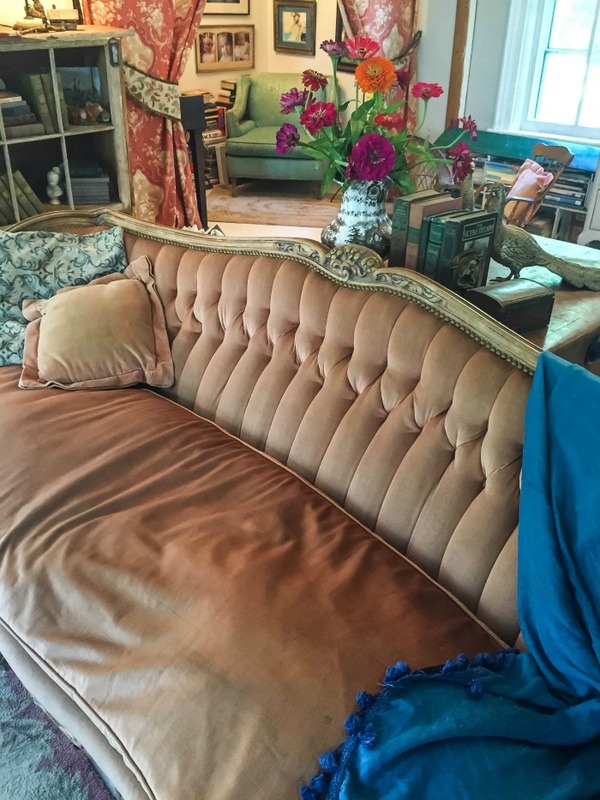 Glad you shared…I’d say you are a eclectic diva! Enjoy your babes. They grow up so quickly and then you wish they were still young. Whah. In my eyes this IS perfection. Such a cozy ,family,beautifully inviting room! You have the style girl ! You have energy to spare? I love your piano nook! You got it right,the value of family. It’s beautiful. Guest cottage um yes!sign me up! I would love to sit and have wine with you,listening to the children play. It’s very charming. I love it! 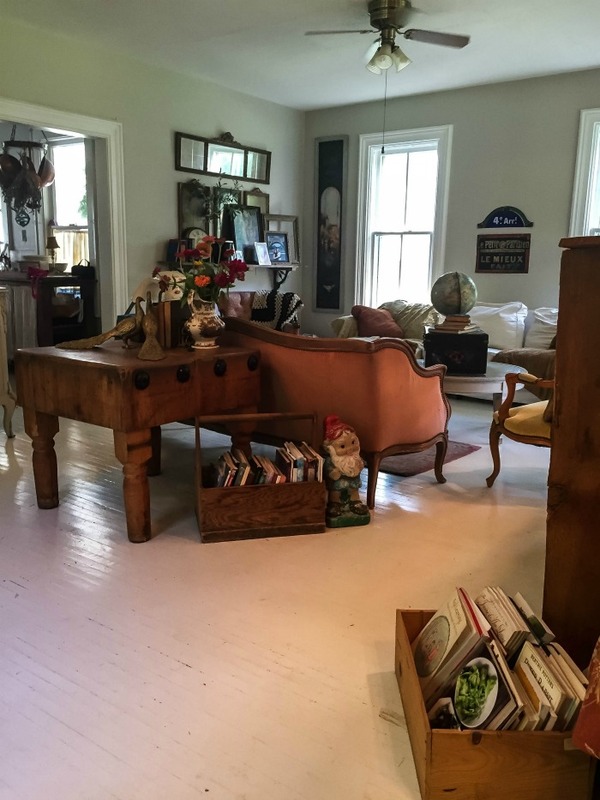 The problem with most French farmhouse pics on Pinterest is that they don’t look livable, attainable, or maintainable. Your pics, however, look real, livable, lovable! The colors are life giving and charming. Your home pics speak life and peace instead of museum: don’t touch. Thanks for the inspiration to enjoy an honest French style. PS. I make a batch of your pasta sauce weekly. My family adores it on pasta, crostini, and wants to make pizza soon. I eat it over zucchini or other veggies. Scrumptious! Love your pictures and inspirations so much! Just would like to sit down, enjoy, relax and be happy in that place. And the colors would be absolutely mine, warm and inviting like a hug of a well worn jacket. You are able to do the mix of an elegant but also relaxed style in perfection without being too perfect. Hope to see more of your home…. 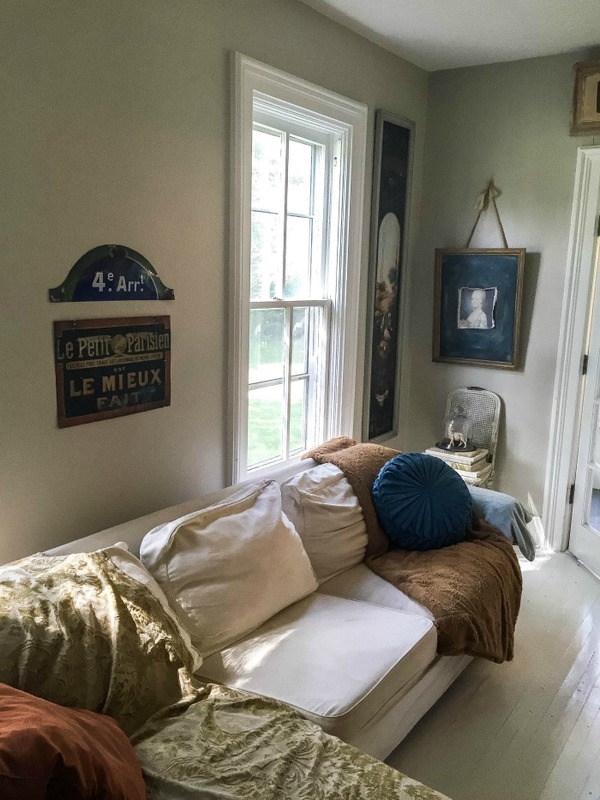 Dear Angela, when I buy all the French decor or country French decor magazines, your living room is what I WANT to see, not all the brand new, industrial/Swedish/white rooms they show. I love your sense of style, your country rustic French. I remember your bedroom in your other house and how much I loved it too. Keep on decorating, and now I cannot wait to see your new home, your new kitchen, your new living and bedrooms!!! I really enjoyed this article! Great pics and style. 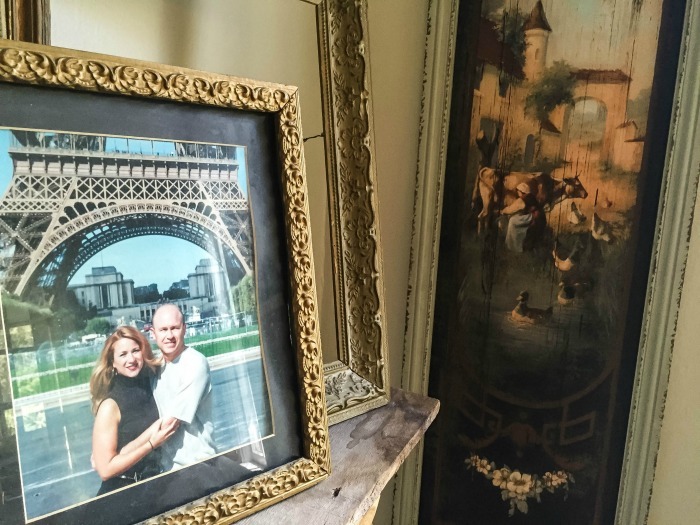 I have been thinking of incorporating some French style in my home. Right now it’s all very traditional. I want to start with my bedroom. Any suggestions for master bedrooms? Also where do I start to find books and magazines? I really want to learn about French design. Do you have any favorite books? I am sick of seeing nothing but white…I love color, this is charming and much more authentic. thank you! I actually stayed in a French farmhouse in my youth. It was charming and far from being a white expanse with pops of Cath Kidston prints. It looked a bit like your house but ancient. Thanks for sharing your pretty home. Your home is so lovely and charming. I don’t know what imperfections you are worried about. I love the pile of books beside the piano. But, then, like you, I love books. If that’s what you call a mangy, garage sale style then that’s my style! We used to play find the legos too – ouch. (5 kids, now young adults). 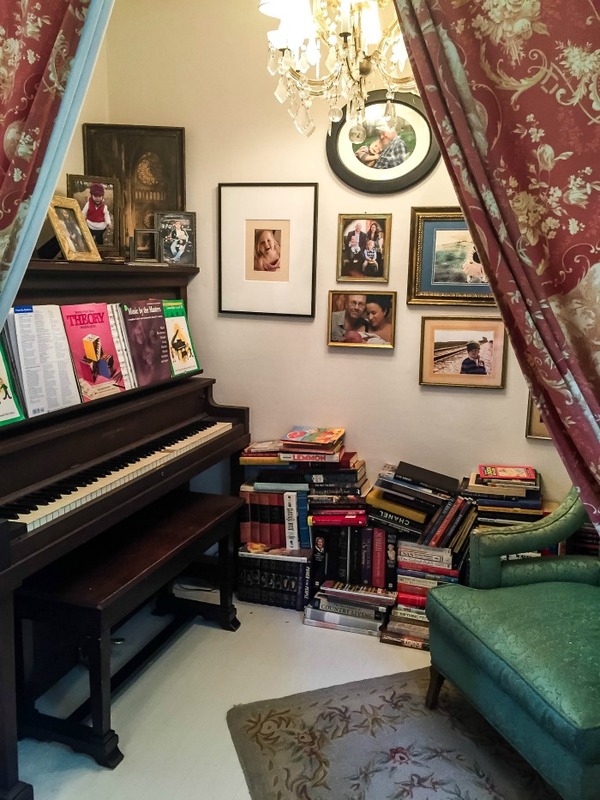 The piano nook is so cozy. But this is brilliant! These imperfections you mention are actually added charm. They show the room as it is lived in, with color and warmth and the suggestion of laughter and movement. I love it. Gorgeous my friend. Man could we have fun at a Paris flea market! Great post; thanks for opening your home to your readers. Wish you could post more often – love all the gardening and cooking info you share. 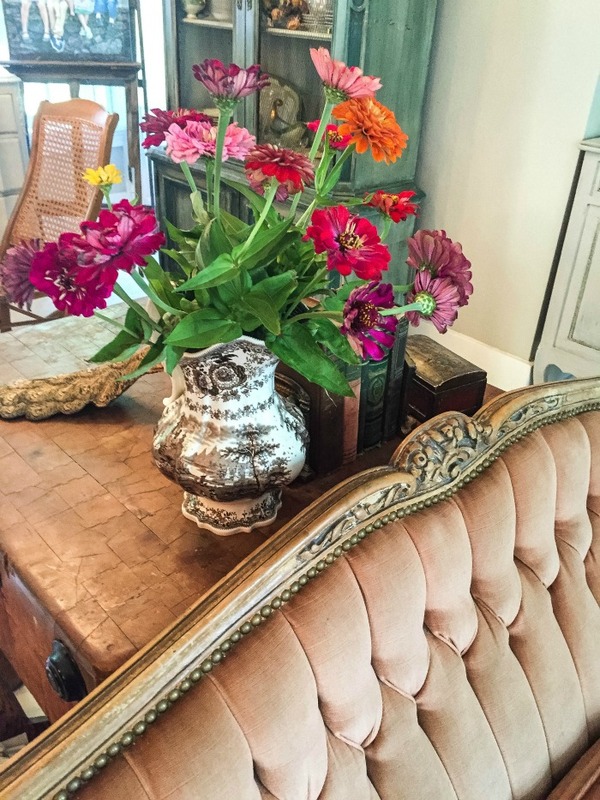 Beautiful textures, patina, fresh flowers and hidden vignettes. A place of wonder for your kids to have so many memories. I hope you can find a new farm with so much potential. I’m looking forward to seeing the farm you are looking for and a glimpse into how you do it. What color are the walls? They look green and also pinkish. They are Revere Pewter by BM. I love your style! 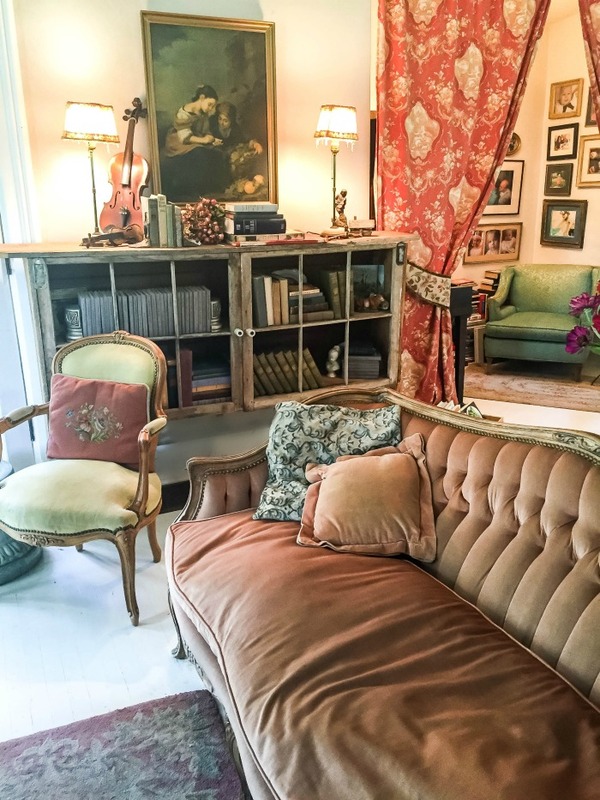 It is refreshing to see a home that was created and decorated with love. There are so many blogs out there showing “perfect” homes that I feel are impersonal and cold. Your home is cozy and inviting. I also love decorating from flea market finds. 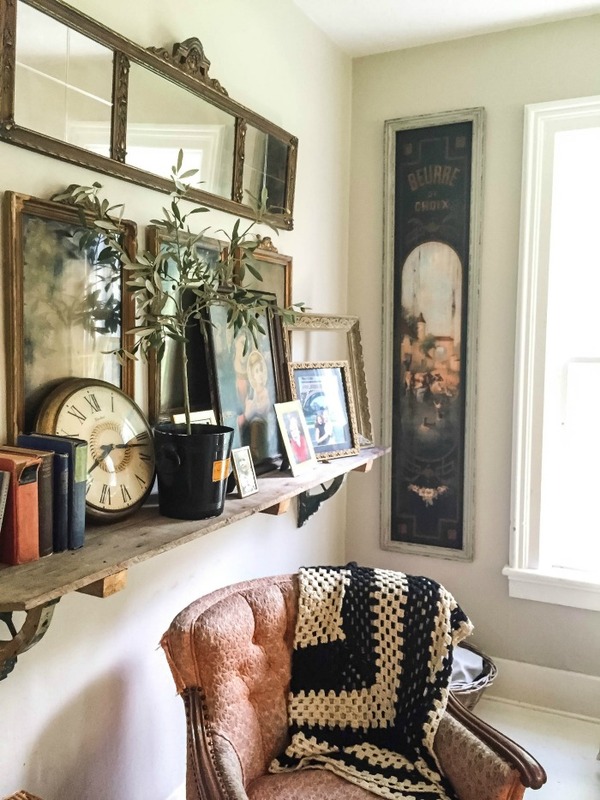 It is wonderful incorporating history into our homes. I have your cookbook and I hope so much that someday you will write a book about the transformation of the everyday chateau. Funny, not one of your lonnng list of things we would be exposed to, though warned, jumped out at me. Your home is so warm and welcoming. Thank you for sharing your new home with us, it has been a lovely visit!